Hello all! Its Friday! Yay! Thank you for stopping by today, I’m guesting over at Winnie & Walter’s Blog celebrating their 2nd Birthday! There’s a bunch of new products to spend your craft allowance one (I know, don’t hate me). My favorites? 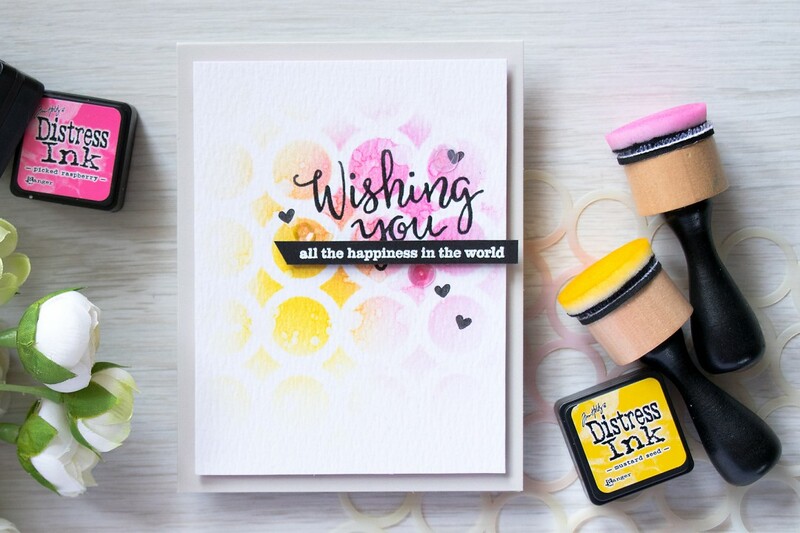 A fun and super bold Pattern Of Rings stencil and Wishing You with Evelin T Designs clear stamp set. All new products from Winnie & Walter will go live at 10:00 p.m. CST on February 26, 2016 in Winnie & Walter online store. This is card was very easy to make and didn’t take much time at all. I started by blending Distress inks onto Tim Holtz watercolor paper; I used Scattered Straw, Mustard Seed and Picked Raspberry. Love how pink blends beautifully over yellows. Love that orange! The reason I used watercolor paper and distress inks is because I wanted to have those gorgeous water spots on my background. I added lots and lots of drops of water to get that look. My sentiment consist of two parts – the heat embossed Wishing You (I had to cut the stamp apart to make it a two line one); I stamped it in VersaFine Onyx Black and embossed in Hero Arts Clear Embossing Powder and heat embossed All The Happiness In The World heat embossed in WOW White Super Fine powder onto black cardstock. 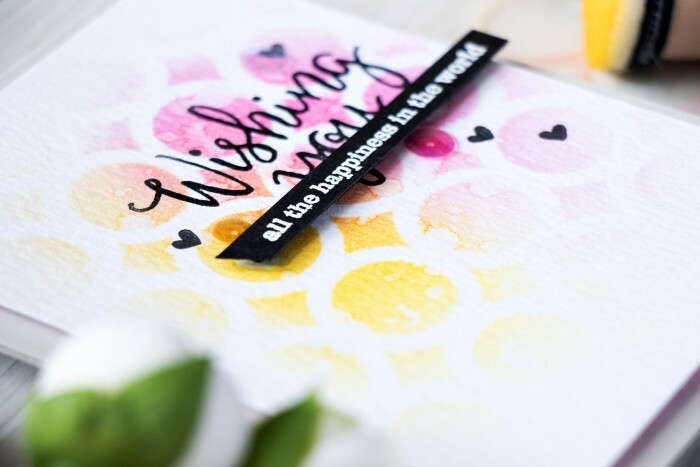 And this is what I really love the Wishing You stamp set – for all the different and unique sentiment additions you can have with the main Wishing You one. This set is actually free with a qualifying purchase from Winnie & Walter’s online store (for a limited time only). I foam mounted the black sentiment strip using Scrapbook Adhesive’s Black Foam Tape and also stamped several little hearts in black around the sentiment. Lastly I adhered several translucent sequins in yellow and pink and foam mounted my panel onto a grey A2 top folding card base. I am sharing a video tutorial showing how to make this card, you can watch it at the top of this post, below or on my Youtube channel. If you like it, I would appreciate you giving it a thumbs up and sharing. You can also pin this video to Pinterest. Thank you! A lovely card Yana and I am a huge fan of that stencil! Love this, I’m definitely going to order this stencil! 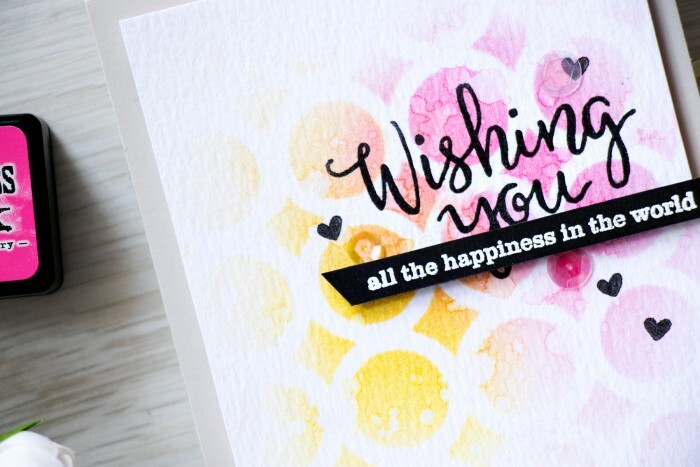 Hi Yana ~ Thanks so much for sharing this CAS (ha, ha) card with us. 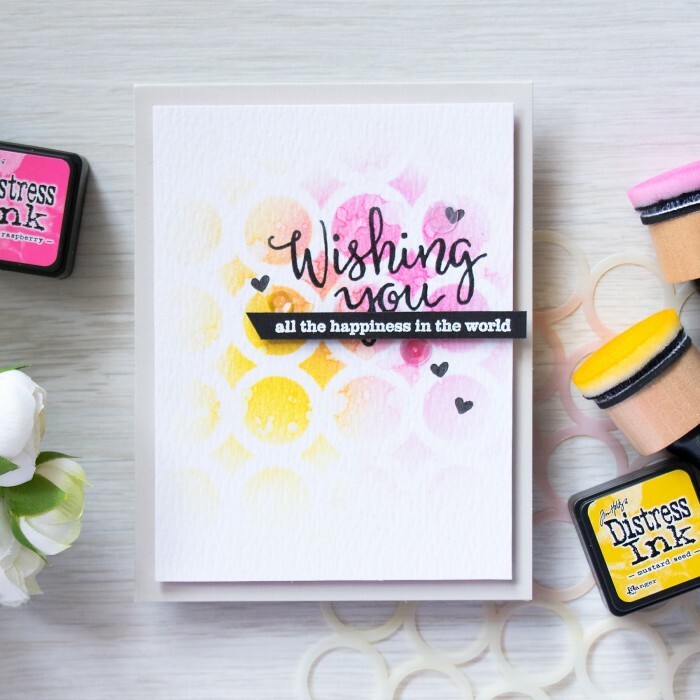 I love both the stencil (which I already own) and I am totally addicted to Distress Inks. I definitely plan on CASEing this card! Great background technique. I love Distress inks.